Happy Birthday to Lit Youngstown! We had our initial formation meeting just about a year ago. We asked one of our YSU interns,Sam Amazing, to dig around on our Facebook page and blog to discover some highlights of our year. This is Sam’s reflection. Hi, everyone! It’s hard to believe, but LitYoungstown is a year old. Since our formation in 2015 we have sponsored or participated in many programs and events in the community. Here’s a look back at them. We hosted a monthly prose and poetry reading the first Wednesday of every month with a special guest, followed by an open mic. Our hope and plan is to present local writers a chance to have their work heard. We started on March 4, 2015 with: A reading from the Fallen City Writers Anthology. The Fallen City Writers have been an institution in Youngstown since the beginning of the 1980s. Their 2014 anthology includes work from a myriad of poetry and prose writers who have passed through their doors. We ended the 2015 reading series on December 2 with: Three Appalachian women poets. The poets were Jeanne Bryner, Karen Kotrba, and Sherri Saines. These were both great readings, and there were many great ones in between. Check out our archives and Facebook page for more posts on the individual readings. We have continued our series in 2016 and are booked with great readers through 2017. We would like to thank Suzie’s Dogs and Drafts for allowing us the space to hold the readings. We also offered classes in poetry, prose, storytelling, memoir writing, playwriting, and screenwriting, taught by skilled writers and scholars. Our six-week-long classes were open to writers of all experience levels and we reached nearly a hundred writers in their literary journey. Our past classes are listed here, and you can read some of our student feedback on this blog post. 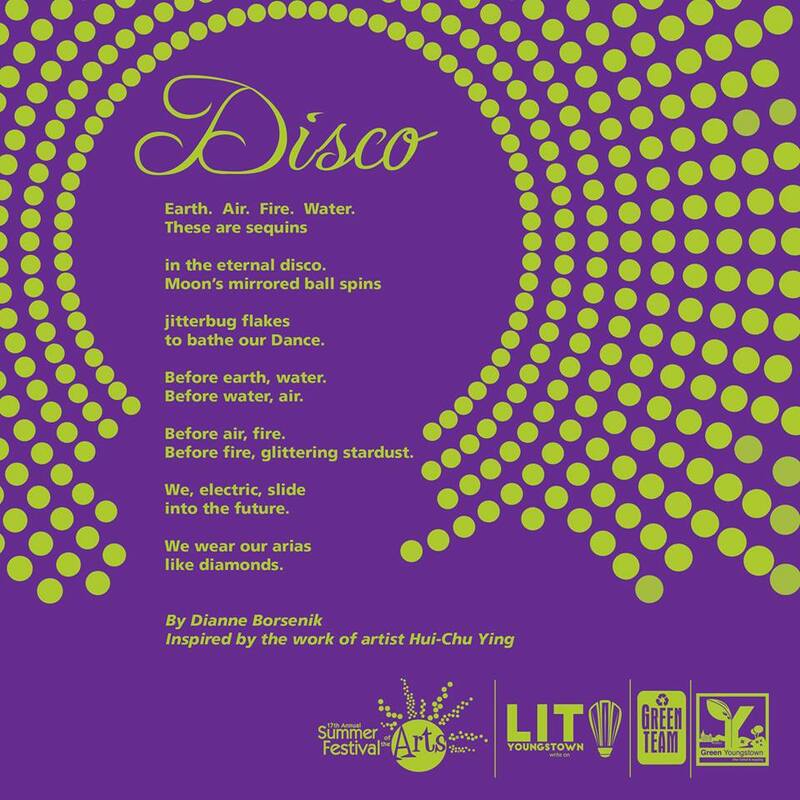 In July we were participants in YSU’s Summer Festival of the Arts, where we gave away more than 500 tote bags imprinted with the poem Disco, by Diane Borsenik, winner of our Ekphrastic poetry contest. We also hosted a poetry/prose reading and invited the public to write short reflections finishing one of the three phrases: ‘I remember the day when…’; ‘I wish I had the courage to…’; I am most inspired to write when…’. Out in the community we’ve co-sponsored readings with the Jewish Community Center, held in the JCC’s art gallery. It was also great pleasure and honor for Lit Youngstown to collaborate with the YWCA on Slice of Life Stories and Dessert. One of the story tellers at the event, Davita Fitzgerald, told a serious story about love and partnership that was also rich with humor. The event helped to raise money for books for the Y’s children’s library. A heartfelt thank you to Flutterby Books Ltd and our donors for supporting the purchase of new books. Read on, young ones! Soon we’ll see you as writers with many stories of your own. LitYoungstown also sponsored a dramatic monologue writing contest through The Strand Project; we received hundreds of submissions. The only local production of its kind, The Strand Project is a collaboration between Selah Dessert Theatre and Lit Youngstown. It is a selection of original dramatic monologues, each piece revealing something about the speaker: inspirations, bad choices, personality quirks, fears, hopes, regrets, dreams, and secrets. The show will run at Selah Dinner Theater at 130 South Bridge Street in Struthers, OH 44471 for two evenings, June 3 and June 4, 2016. Each performance will be followed by refreshments and a talk back with the production team, cast, and writers who are able to attend. In Fall 2015, Lit Youngstown ran a successful crowdfunding to raise resources to take our next steps. We are using the donations to bring in more writers, form collaborations between writers and visual artists, begin community outreach writing, and other engaging projects. If you’d like to donate, click here. LitYoungstown hit the ground at a sprint in 2015, and we have no intention of slowing down in 2016. Let us know if you want to join our newsletter mailing list which is now more than 500 literary folks strong. Just email us at lityoungstown@gmail.com. Thanks for your support. Let’s grow LitYoungstown! This entry was posted in Uncategorized on February 24, 2016 by lityoungstown.